We all make choices each and every day. Do I wear the red or blue shirt to the office? Will I have water or sweet tea with lunch? Do I really need that piece of pie for dessert? It looks and smells so good! Our lives are filled with choices, but there is one choice that is guaranteed to release God’s power and blessings in our lives. Throughout the centuries, God’s believing people have lived in many cultures, facing many challenging circumstances. Yet through them all, one choice has always brought success—choosing the way of truth. In the Old Testament, Daniel was a man who came to many crossroads and chose this way. His confident and courageous stand allowed God’s power to abound. The God Whom Daniel served is the God we serve today. As we observe the example of Daniel, think what blessings await us as we serve God. God’s abundance and power are ours as we choose the way of truth. In the third year of the reign of Jehoiakim, king of Judah, came Nebuchadnezzar, the king of Babylon, to Jerusalem. He besieged the city and took some of the people captive. Among those taken to Babylon was a young man named Daniel, along with his companions, Shadrach, Meshach, and Abednego. Nebuchadnezzar appointed those taken captive a daily provision of food and wine to nourish them. These provisions, along with other training, were to prepare them to serve in the king’s palace. In the law of Moses, God’s Word to the children of Israel, there were certain animals that were forbidden as food sources. Knowledgeable of God’s Word, Daniel purposed in his heart, the innermost part of his mind, to live according to the Word. God blessed Daniel and his companions by bringing them into favor with the prince of the eunuchs, who allowed them to be nourished according to the precepts of God’s Word. God gave them knowledge and skill in all learning and wisdom. Daniel had understanding in all visions and dreams. These men gained great spiritual perception and awareness by choosing the way of truth. And the king communed with them; and among them all was found none like Daniel, Hananiah [Shadrach], Mishael [Meshach], and Azariah [Abednego]: therefore stood they before the king. And in all matters of wisdom and understanding, that the king inquired of them, he found them ten times better than all the magicians and astrologers that were in all his realm. Daniel’s choice to live the Word’s way released God’s abundant blessings not only for him, but also for his companions, who chose the way of truth as well. In all matters of wisdom and understanding, King Nebuchadnezzar found them ten times better than all the magicians and astrologers in his realm. Now, that’s abundant! Like Daniel, we can hide God’s Word in our hearts to the end that we choose to live according to God’s Word, the way of truth, in various life situations. How big will God’s blessings be for us as we choose to live the way of truth? His Word says He is “able to do exceeding abundantly above all that we ask or think, according to the power that worketh in us” (Ephesians 3:20). One night Nebuchadnezzar had a very unsettling dream. When he awoke, he could not remember the dream and was deeply troubled to know the dream and its meaning. He called together the magicians, astrologers, sorcerers, and Chaldeans of his kingdom and demanded that they would make known to him the dream and the interpretation. What kind of a request was this that the king required of the wise men in his kingdom? An impossible request! There was not a man upon the earth who could fulfill this request, and that is what they told the king. The king in his anger commanded to destroy all the wise men of Babylon. The decree that went forth to slay all the wise men included Daniel and his companions. What did Daniel do? He sought out the believing support of his companions. Knowing that the answer to the king’s matter would not come from a man and that their lives were on the line, Daniel and his companions courageously stood together in petitioning God for the answer needed in this predicament. They believed together for the solution to this very stressful situation. Again, if two lie together, then they have heat: but how can one be warm alone? Their bold, confident stand together allowed the power of God to abound. God revealed to Daniel the king’s dream and the interpretation of it. Can you imagine how blessed and thankful Daniel, Shadrach, Meshach, and Abednego must have been? What an awesome God we have! I thank thee, and praise thee, O thou God of my fathers, who hast given me wisdom and might, and hast made known unto me now what we desired of thee: for thou hast now made known unto us the king’s matter. Having the answer to the king’s matter, Daniel went in unto King Nebuchadnezzar and confidently declared unto him the dream and the interpretation as God had revealed it to him. The king immediately recognized the power of God at work. Then Daniel requested of the king, and he set Shadrach, Meshach, and Abed-nego, over the affairs of the province of Babylon: but Daniel sat in the gate of the king. Daniel’s bold believing action, together with that of his companions, allowed the power of God to be made manifest in this tremendously stressful situation. The mighty blessings of God abounded in their lives to the end that they were put into great positions of authority and service in the province of Babylon. Daniel served under several different kings in Babylon, and with each one, he chose the way of truth, thus unleashing the power and blessings of God for himself and others. Forasmuch as an excellent spirit, and knowledge, and understanding, interpreting of dreams, and shewing of hard sentences, and dissolving of doubts, were found in the same Daniel…. Daniel continued to grow in his knowledge and understanding of the way of truth throughout his life. His courageous choices and his bold, confident stand allowed the power of God to be manifested and God’s blessings to abound. We grow in our knowledge of God’s Word by hiding it deep within our hearts. As we make courageous choices to live the way of truth, we too will see the power of God manifested and His blessings abounding in our lives. Years later, when the Medes and Persians took over the Babylonian Empire, Daniel retained the high position he had held under the Babylonians. Daniel served under King Darius the Median (Daniel 5:31), who set one hundred twenty princes over his kingdom. Over these princes he set three presidents, of whom Daniel was first. Daniel was preferred above the presidents and princes because an excellent spirit was in him, and King Darius thought to set him over the whole realm. Not liking the king’s choice of leadership, Daniel’s peers—the other princes and presidents—sought to find grounds of accusation or to bring charges against him concerning his conduct in carrying out his duties in the kingdom. But they couldn’t find any evidence of corruption, nor could they find anything to criticize or condemn. Daniel had chosen the way of truth. He was trustworthy and faithful in carrying out his responsibilities with respect to his management of the governmental affairs in the kingdom of Darius. Not a single instance of negligence or faulty administration could be found. Seeing that Daniel was faithful with no fault or suspicion found in him, these other princes and presidents concluded that they would not find any occasion against this Daniel except they find it against him concerning the law of his God. They agreed together, then convinced King Darius to establish a royal statute that for the next thirty days whoever asked a petition of, or prayed to, any god or man except of the king would be cast into the den of lions. According to the laws of their kingdom, once the decree was signed, it could not be altered or changed by anyone, including the king himself. The king signed the decree. Undaunted by the signed writing, Daniel purposed in his heart to live the Word’s way by praying and giving thanks before his God as he always had done—three times daily. Prayer was how he had gotten the answers to previous dilemmas; he was a man of prayer. Choosing to live the way of truth could now cost Daniel his life. He would be cast into the lions’ den if, in the next thirty days, he was caught praying. Then they came near, and spake before the king concerning the king’s decree; Hast thou not signed a decree, that every man that shall ask a petition of any God or man within thirty days, save of thee, O king, shall be cast into the den of lions? The king answered and said, The thing is true, according to the law of the Medes and Persians, which altereth not. The king upon hearing this was sorely displeased with himself. This man, Daniel, who had served him faithfully, totally exemplary and trustworthy, was now to be cast into the den of lions. The king labored all day till the going down of the sun to deliver Daniel. However, these other princes and presidents reminded him that no decree that the king established could be changed. Even though King Darius was obligated to carry out the sentence, he confidently reminded Daniel that his God, Whom he served continually, would deliver him. This is very interesting. King Darius, in the midst of carrying out this apparent death sentence against Daniel, reminded him that his God would deliver him. Do you think the king knew this because Daniel in previous conversations with the king told him about the power and blessings of his God? Maybe King Darius read in the journals of those who ruled before him of the great power and blessings of God unleashed as Daniel believed God under their reigns. Perhaps King Darius had an opportunity to see firsthand the power of God in manifestation! Well, if he had not had the opportunity previously, he was about to. My God hath sent his angel, and hath shut the lions’ mouths, that they have not hurt me: forasmuch as before him innocency was found in me; and also before thee, O king, have I done no hurt. Daniel was a servant of the living God. He chose the way of truth, keeping God first in his prayer life. His bold stand allowed God’s power to abound. God delivered Daniel by sending His angel to shut the lions’ mouths. No manner of hurt was found upon him because he believed in his God. The king was exceedingly glad. Following this incident, King Darius made another decree declaring that in every dominion of his kingdom men should worship and reverence the God of Daniel, for He is the living God. King Darius went on to declare that Daniel’s God delivers, rescues, and works signs and wonders in heaven and in earth. 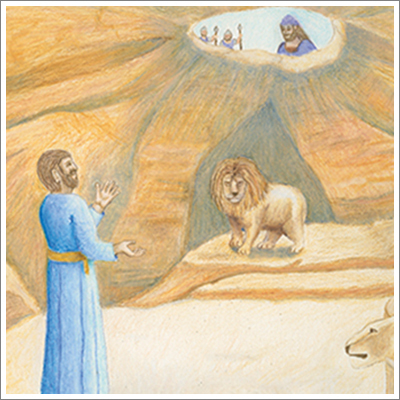 The king declared to everyone under his rule that the living God delivered Daniel from the power of the lions. He was witness to the power of God unleashed! In the Old Testament example of Daniel, we have observed how he faced many challenges. In each challenge, he chose the Word’s way—the way of truth. His bold stand allowed God’s power and blessings to abound not only to him but also to others around him. In our lives, we too may encounter challenging circumstances in which choices need to be made. The one choice that is guaranteed to release God’s power and blessings in our lives and to those around us is to choose the way of truth—so let’s choose it! This is a reprint from the January/February 2012 issue of The Way Magazine. Copyright© 2012 by The Way International. All rights reserved.